(Newser) – One man's cash is another man's treasure. Just ask Kevin Lipton, a Beverly Hills man who placed the winning bid of $2,585,000 for a rare penny last Thursday. Lipton doesn't find anything unusual about paying so much for this rare Birch Cent, one of only about 10 coins that were "experimentally produced" after the US Mint was established and that still exist, a co-chairman of Heritage Auctions reveals to the Los Angeles Times. "It's like our very first penny. It's such a spectacular coin. It's so important, so rare," Lipton tells the Times. 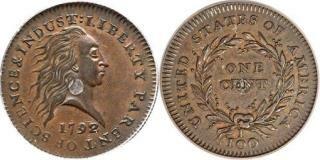 He also nabbed a 1792 quarter for an additional $2.2 million. I'LL buy that for a DOLLAR! (ROBOCOP 1987)!! There ya go ALL!! Wish I could afford that hobby...will he trade for my Indian head pennies?